Stir up some Gritty Funk, Rock n Roll and New Orleans' Blues with a dash of Latin seasoning and you'll have what Hector Ward & The Bigtime are serving up! Bam! 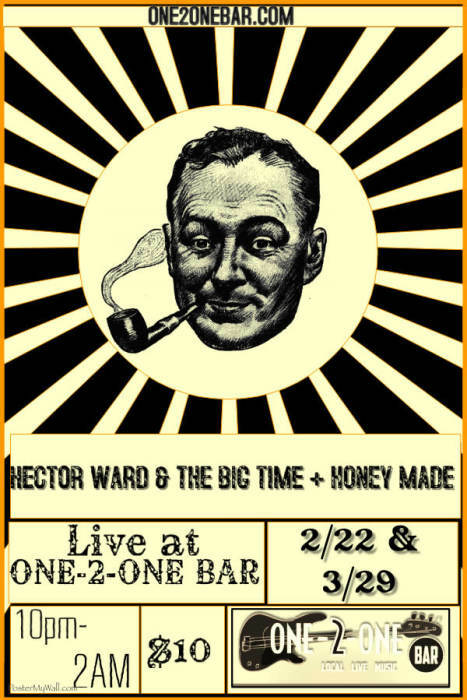 From Austin, Texas The Live Music Capital of The World, Hector Ward & The Big Time is an original 8 piece Latin Grooves Funk Orchestra seared in Blues and Rock & Roll. Endeared to audiences worldwide, the son of Cuban refugees twenty years of experience in the Austin music scene shows in the band's ecclectic high energy, dance-floor filling shows. The Big Time's engulfing sound mesmerizes and surrounds their audience with tasty horn-rimmed roots, raunchy guitar licks, powerful vocals and good times. HWBT delves into many different styles that captures Blues, Soul, Country, Funk and Afro-Cuban Roots. With several Austin music scene accolades including Austin Chronicle's Best New Local Acts list, one Writer's Top 25 songs, a Best Of Criticks Pick in the Austin Music Awards, two albums under their belts, their impressive annually running SXSW "Blackfinger Festival" (https://www.facebook.com/BlackfingerDayParty/ ), new music in the works and a just released 22 song live record, 'Evolution - Live From The Saxon Pub', Hector Ward and the Bigtime are coming at you like a runaway freight train. The funky members include Hector Ward on guitar and lead vocals, Mike McGurk on Drums, Scott Beardsley on Bass Guitar, Hunter St. Marie on Lead/Rythm Guitar, and David Farris on congas and percussion. The horn line, known for enthusiastically leaving the stage and taking the music into the audience, include: Stephen Farmer on trumpet, Oscar Ornelas on tenor saxophone and Ben Taylor on trombone. Funk & Soul from deep in the heart of Texas. Honey Made combines styles of funk, soul, R&B, jazz and many more to bring you a one of a kind party experience.